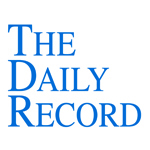 This week's Daily Record column is entitled "New York addresses legal blogging ethics." Although blogging has been around for well over a decade now, our profession was late to jump on the bandwagon. Nevertheless, the ethics of legal blogging has been an issue from the get go. For example, when blogging first reared its ugly head, there was much debate about whether a legal blog constituted an “advertisement” as defined by the Rules of Professional Conduct. Before diving into the committee’s analysis and conclusion — two observations. First, I find it hard to believe that one attorney has such animosity toward another attorney that s/he feels the need to: 1) establish a blog criticizing that attorney, and 2) had foresight to seek the committee’s ethical blessing prior to doing so. If nothing else, the convoluted and time consuming nature of this undertaking makes me wonder what kind of world we’re living (and practicing) in? That being said, before I go too far astray, let’s delve into the committee’s analysis of this inquiry, shall we? The committee then tempered its conclusion by applying the restrictions of Rule 8.4 (d) and then adding that critical lawyers should keep in mind that pursuant to the “Standards of Civility” adopted by the Uniform Court System, attorneys “should avoid vulgar language, disparaging personal remarks or acrimony towards other counsel, parties or witnesses.” Finally, the committee also observed that pursuant to Rule 8.3(a), lawyers are required report the misconduct of other lawyers to the appropriate tribunal. In other words, feel free to trash talk your colleagues online, but keep it clean. And, trash talking is a double edged sword: if you insist on blogging about your colleague’s malfeasance, you’ll also have to turn your unethical colleague in — or risk facing a disciplinary claim yourself. Have you ever wondered what law practice management lessons can be gleaned from the latest legal technology news? Well, wonder no more! Instead, just head on over and read my weekly posts at the MyCase blog. Peruse my musings and, if you're up to it, add your 2 cents. Client Portals: The Future of Law Practice Management? Are client portals the key to competing (and winning) in the 21st century? Google’s Project Glass: Should Lawyers be Worried About 24/7 Connectivity? What's a busy lawyer to do when clients demand 24/7 access to information? Instagram and the Future of the Legal Profession. Can Instagram's unprecedented success offer lessons for better client serice? Are police unlawfully accessing social media accounts? This week's Daily Record column is entitled "Are police unlawfully accessing social media accounts?" It’s undeniable: social media use has permeated our culture. People are sharing information about all aspects of their lives via social networking sites. Some of these disclosures are broadcast publicly while others are limited to select friends and followers. This broad scale sharing of information has not gone unnoticed by the legal profession. In past columns I’ve discussed the recent efforts of lawyers to mine social media for evidence, resulting in a number of ethics opinions that attempt to provide guidance and establish ethical boundaries for lawyers as they wade into the electronic minefield of social media. But, as an attendee asked when I recently spoke at a seminar sponsored by the Monroe County Public Defender’s Office, what about law enforcement? How far can police officers go when seeking to obtain access to social media evidence in order to prove the guilt of an accused? I thought it was a great question and suggested that it was an issue that the courts would increasingly have to wrestle with as law enforcement stampeded into uncharted social media territory. And, an example of just such a decision arrived a few weeks later. I received an email from one of the attendees, well-known Rochester criminal defense attorney and prolific author, Gary Muldoon and he advised me of a recent case on point, People v. Munck, 92 A.D.3d 63, 937 N.Y.S.2d 334 (3d Dept. 2011). Tarsia is a case that delves in depth into the issue of coercion during police questioning. Specifically, the court was tasked with determining whether Tarsia’s consent to allow the police to use a voice stress test during his interrogation was the product of coercion. In other words, the court in Tarsia was focused on the use of coercion to induce a confession of guilt. The defendant understood that the officers were attempting to get him to admit to a crime. He knew why he was being asked to consent to the voice stress test. However, in Munck, the law enforcement tactics used were far more deceptive. This becomes obvious when, as I always suggest should be done when dealing with the online world, the situation is compared to a similar offline analogy. Here, the officer feigned an interest in Web design in order to obtain access to Munck’s MySpace information. Thus, the tactics used were akin an officer claiming expertise as a book editor and then asking the defendant to disclose the location of his diary so that the officer could review it for purposes of submitting it as a memoir to a book publisher. The reason the officer request access to Munck’s MyCase password was anything but forthright. The convoluted tactics used were “fundamentally unfair” and “trammeled” on Munck’s rights. Just because the Internet is still viewed as the “Wild West” doesn’t mean law enforcement officers can ignore the Constitution and run willy nilly over the rights of the accused. Unfortunately, I think Munck sets that precedent. My hope is that over time, as Internet-based tools become more familiar, a new sheriff will come into town (in the form of a decision from another Judicial Department or the Court of Appeals) and will set the record straight. Nicole Black is a Rochester, New York attorney and the Vice President of Business Development and Community Relations atMyCase, a powerful and intuitive cloud-based law practice management platform. She is also a GigaOM Pro Analyst and is the author of the ABA book Cloud Computing for Lawyers, co-authors the ABA book Social Media for Lawyers: the Next Frontier, and co-authors Criminal Law in New York, a West-Thomson treatise. She is the founder of lawtechTalk.com and speaks regularly at conferences regarding the intersection of law and technology. She publishes four legal blogs and can be reached at nblack@nicoleblackesq.com. Just a quick note to let my regular readers know that as part of my duties as Vice President of Business Development and Community Relations for MyCase--a powerful and intuitive cloud-based law practice management system--I'll be blogging and tweeting on behalf of MyCase about law practice management and cloud computing issues. If you're interested in reading the blog posts, you can follow the MyCase blog here. And, if you'd like to follow their Twitter account and stay up to date on the latest law practice management and cloud computing trends, you can follow the MyCase Twitter account here: @MyCaseInc. Of course, I'll continue to post here at Sui Generis and you can find me on Twitter as well (@nikiblack). Finally, if you're in the market for new law practice management software or just want to give MyCase a trial run, drop me a line (niki at mycaseinc dot com) or simply sign up for a free 30-day trial account (no credit card required!) here. This week's Daily Record column is entitled "Apps, social media enhance conference experience." Last week, I attended the annual ABA Techshow in Chicago. It’s one of my favorite legal technology conferences. While there, I learned a lot and really enjoyed spending time with old friends and meeting new ones. It was also the first conference I attended as a vendor, rather than simply a participant, now that I’m vice president of MyCaseInc.com, something made the experience all the more interesting. My time in Chicago wouldn’t have been the same if I hadn’t had social media and mobile apps at my disposal. This is because with the advent of new social technologies and tools, legal conferences aren’t the serious, imposing events that they used to be. These days, legal conferences are completely different ballgame, in large part because we now have social media and mobile apps available to facilitate communication, learning and socializing. Selective use of these tools can truly enhance your legal conference experience — it’s just a matter of figuring out which ones best fit your needs and your comfort level with emerging technologies. Twitter is a great tool to use for communicating and for connecting with others. One way to do this is to tweet summaries of content from conference sessions. Doing so allows you to provide useful information to your followers, something that many of them will appreciate. As you tweet, make sure to use the hashtag for the event, which is the word chosen by conference organizers to represent the event, preceded by the number sign. So in the case of the ABA Techshow it was #ABATechshow. However, take care to avoid overloading your Twitter stream with an excessive amount of tweets, since some of your followers might find that to be annoying. You can also use Twitter to connect with other conference attendees by creating a Twitter list of those who will be attending the conference. To do this, follow the hashtag created for the event and and then add to your Twitter list people who mention that they’ll be attending the conference. You can also send out tweets to your followers asking who plans to attend. Creating a list of conference attendees provides a useful service for other attendees while simultaneously allowing you to get on their radar, since Twitter users receive notifications whenever they are added to a Twitter list. Another way to use Twitter is to simply send out a tweet that includes the conference hashtag announcing that you’ll be in the hotel lounge for the next half hour and welcome the company of others. I’ve done this on many occasions and every time I’ve connected with people that I otherwise never would have had the pleasure of meeting in person. If you blog, you can also connect with online friends using your blog. Simply write a post about the fact that you’ll be attending the conference and let your readers know that you’d like to connect while in town, even if they’re not attending the conference. Mention this on Facebook and Twitter, too. Doing so is a great way to take online relationships offline and thus expand your professional network. I bet you’ll be surprised by how many people respond to your request to meet up while in town. You might also want to organize a dinner or happy hour while in town. I use Evite.com for this purpose. You simply create the invitation from a template and then, using their email addresses, invite people that you know will be attending the conference or who live in the area. One great Evite feature is the setting that allows your invitees to invite others using the Evite platform, thus allowing the guest list to grow naturally and organically. The TripIt app is also a useful tool for conference-goers. This app helps you to plan your trip, keeps all of your itineraries in one place, and also advises you which people in your TripIt network will be in town at the same time that you are. This feature provides you with yet another way to connect offline with those in your social and professional network. Finally, download the “Bump” mobile app. Using this app, two mobile phone users simply open the app and bump phones. Your information is instantaneously exchanged and a new contact is automatically created in your contacts file. As you can see, social media and mobile apps add a whole new dimension to legal conferences. These 21st century tools facilitate networking and make attending legal conferences all the more enjoyable and worthwhile. The following is a special edition article that I wrote for the Daily Record about ABA Techshow 2012 entitled "ABA Techshow 2012: Legal Technology and Innovation at its Finest." Every year in early spring, legal technology enthusiasts from across the United States, Canada and even Europe, converge upon the Chicago Hilton to attend the American Bar Association’s premier legal technology conference, ABA Techshow. For those unfamiliar with this conference, it is sponsored the the ABA’s Law Practice Management Section and its goal is “to bring lawyers and technology together.” It does this by presenting multiple and varied technology tracks. This year there was a strong focus on mobile technologies and apps, cloud computing, paperless offices and collaboration techniques and tools. The conference kicked off with an exciting pre-conference event on the evening of Wednesday, March 28th: Lexthink.1, a series ten 6-minute talks given by leaders of innovation in the legal field. The theme this year was “Serving Clients Better” and a sampling of the inspiring talks included: 1) “Legal Industry Startups: An Overview” by Rich Granat of DirectLaw; 2) “One Word That Will Reinvent How You Serve Clients” by Jay Shepherd of Prefix; 3) “Don’t Just Communicate” by Matt Spiegel of MyCase; and 4) “Back to the Future” by Mark Britton of Avvo. Videos of all talks will be available in a few weeks (online: http://www.pointonelaw.com/). The official start of the conference was the next day, Thursday, March 29th. The Keynote was given by Ben Stein, well known for, among many other things, his role as the mind-numbingly drab, drawling Economics teacher in “Ferris Bueller’s Day Off.” His delightfully funny Keynote focused on economics and the law, but what I found to be the most interesting aspect of his talk was how it came to be in the first place. Apparently when the Techshow board met in California last year to plan the 2012 event, Ben Stein was on their short list for Keynote speakers, but they were unsure whether this event would be enough of a draw for him, given his celebrity. Following the meeting in which the Keynote was discussed, a member of the Techshow board, Natalie Kelly, the Director of the State Bar of Georgia's Law Practice Management Program in Atlanta, Georgia, went on a shopping excursion. As she stood near the jewelry counter of a department store in a well-traveled mall, who should walk out of the elevator but Ben Stein! She expressed her surprise by exclaiming, “It’s Ben Stein!” To which he replied, “Yes, it is.” And from that peculiar happenstance, a Keynote was born. That Techshow’s Keynote arose from such a serendipitous occasion does not surprise me, since it mirrors the experience of Techshow itself--which draws lawyers enthralled with technology. This convergence of like-minded individuals in once place tends to result in a plethora of seemingly random encounters and connections which lead to lifelong friendships and enduring business relationships. After all, that’s a big part of what Techshow is all about: connecting with other legal technology enthusiasts who share a vision of our profession where technology and the law not only peacefully coexist, but actually work together to improve the delivery of legal services to clients. Of course,Techshow’s not just about networking, although that’s an integral part of this conference--it’s also about learning about the latest trends in legal technology. And, there were plenty of opportunities to do just that, whether from the recently released ABA legal technology books, the official Techshow sessions, the vendor track and vendor-sponsored “lunch and learn” sessions, or from perusing the offerings of legal technology vendors on the EXPO floor. There was a wide offering of new books this year, including “Limited Scope Legal Services: Unbundling and the Self-Help Client” by Steph Kimbro, “LinkedIn in One Hour for Lawyers” by Allison Shields and Dennis Kennedy, “The iPad in One Hour for Lawyers” by Tom Mighell, “Microsoft OneNote in One Hour for Lawyers” by Ben Schorr, and my newest book, “Cloud Computing for Lawyers.” These books, and many more, can be purchased at the ABA’s online store (online: https://apps.americanbar.org/abastore/index.cfm). Between the official Techshow track and the vendor-sponsored seminars, there were over 60 sessions to choose from. My favorite session was the “60 iOS Apps for Lawyers in 60 Minutes” given by attorneys Josh Barrett, Brett Burney, and Jeffrey Richardson. This presentation stood out due to the quality of the content and the beautifully designed slides. The speakers presented the material with ease and humor and obviously knew their stuff. The apps discussed were highly relevant to lawyers who use iPhones and iPads in their practices. Should you be interested, the entire list of apps discussed can be found at Jeffrey Richardson’s well-traveled blog, “iPhone JD." Another highlight of the conference was the Plenary speech, “The Future of Law Practice: Dark Clouds or Silver Linings,” given by Jim Calloway, the Director of the Oklahoma Bar Association's Management Assistance Program. According to Calloway, technology will be the defining factor between lawyers who survive in midst of these rapidly changing times and those who don’t. He explained that the only way that lawyers can hope to thrive is to reinvent their law offices to be more efficient and competitive. As part of this reinvention of law practice, he stressed the importance of project management, document assembly, online back up, and alternative fee arrangements. His 5 take away points were that: 1) Great client service and client portals will be a key requirement to a successful law practice in the very near future; 2) Lawyers must invest in more efficient business processes; 3) It is essential that lawyers implement better document assembly; 4) Lawyers need to pay attention to societal trends and changes; 5) Lawyers must innovate and improve every year; and finally 6) Information technology will be huge part of our future. Lawyers who don't get it won’t make it. In other words, as I’ve oft-repeated: Innovate or die. While it sounds ominous and over the top, it’s an unfortunate truth that the legal profession must understand and act on in order to be successful in the face of never-before-seen technological change. The effect of this rapid and far reaching change upon our culture is unprecedented and simply cannot be ignored. But of course, lawyers who attended Techshow this year already know that and because of the knowledge gained in Chicago, are poised to be at the forefront of our profession, leading the way into the uncharted technological frontier that is our newfound reality. Are you as well prepared as your colleagues who attended Techshow? If not, you might want to consider making a trip to Chicago next spring. You’ll have a great time, expand your professional network, and arm your law practice with the tools needed to thrive in this rapidly changing, new world, technology-based economy. 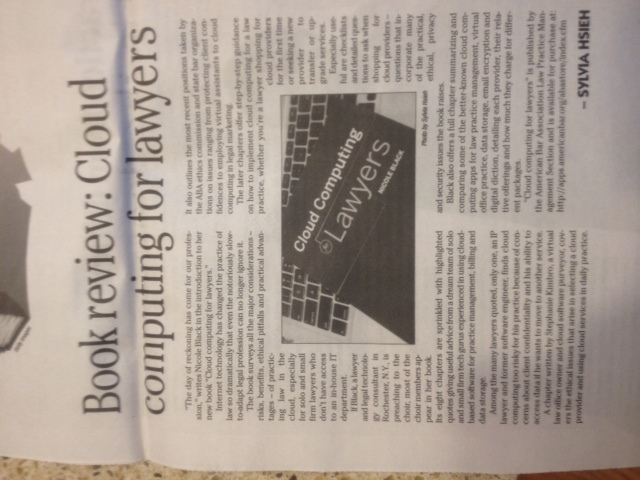 LawyersUSA Reviews my Book "Cloud Computing for Lawyers"
In March, LawyersUSA reviewed my latest ABA book "Cloud Computing for Lawyers." 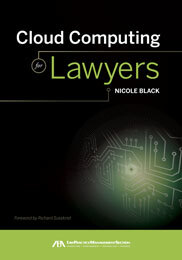 This book provides lawyers with an overview of the issues they need to understand when using cloud computing in their law practices. Especially useful are checklists and detailed questions to ask when shopping for cloud proivders--questions that incorporate many of the practical, ethical, privacy, and security issues the book raises. If this sounds like a book that you might find useful, you can purchase it here.